Aristotle Univ. of Thessaloniki Racing Team “ART” – SIMTEC EUROPE d.o.o. Formula SAE or Formula Student is an international engineering competition, where teams from Universities all around the world race against each other using formula-style cars that the students themselves have designed and built. Since its creation in 2006, Aristotle Racing Team “ART” from the Aristotle University of Thessaloniki has been one such team, competing with the two racecars it has built so far in several European FSAE races. Now in the process of constructing a third one, ART was looking to further improve performance by incorporating CFD into the design of its new intake manifold. 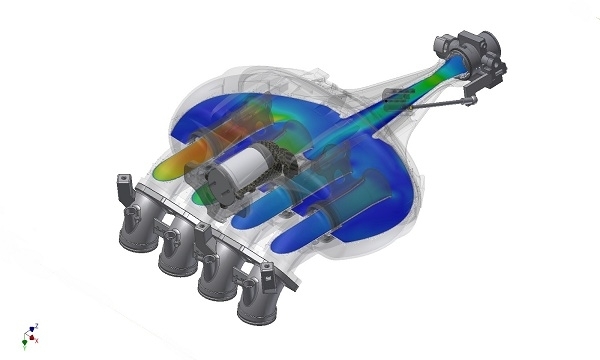 After a two-day training seminar at the SIMTEC offices and with the support of SIMTEC’s CFD experts, ART was able to set up a transient CFD model of the airflow inside the intake manifold, by using the ANSYS FLUENT software provided by SIMTEC. The control volume begins with a flow restrictor imposed by the FSAE rules, continues with a diffusor that leads to the intake plenum and ends with the four intake runners that connect the manifold to the engine. The simulation was performed as if the engine was running at 7000 RPM and the runner outlets were opening and closing accordingly. The final computations were performed at SIMTEC’s new cluster computer, providing quick results which offered the team the chance to validate its design by examining the pressure wave interactions inside the intake plenum caused by the intake valves’ rapid opening and closing and ensuring that the highest pressure in the intake runners was reached just before the opening of a valve thus achieving increased volumetric efficiency in the combustion chamber.